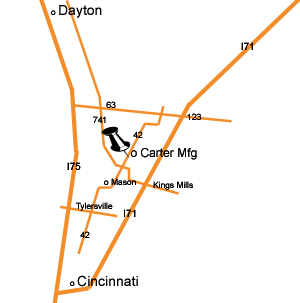 Carter Manufacturing has been operating in a job shop capacity in the Mason, Ohio area since 1973. We have been known for our excellence, resourcefulness, integrity, and personal service. Carter Manufacturing, Inc. understands every quality part commences collaboration between our customers, suppliers, and workers. Our machinists have the knowledge and expertise to operate at a high level of efficiency. We are proud to continue our tradition of providing you with the finest products at the best prices. Carter Manufacturing is committed to obtaining total customer satisfaction by providing Jig & Fixtures, Turnkey Robot Stations and General Machining. We excel in Reverse Engineering, OEM, and Machine Parts for cost savings to our customers. Our team of 25 employees and including several that have been with us for 40 years. We take great pride in our recognized ability to communicate effectively with a diverse customer in an expansive concept that applies to a wide variety of situations. Both large international companies and small upstart companies have benefited from our efforts. Carter Manufacturing focuses on customer contentment, attention to detail, and top-notch customer service. I-71 & I-75 in Mason, Ohio. Copyright © 2008 - 2019 Carter Manufacturing Co. Inc.